On November 21st the city of Milwaukee will hold its annual holiday lights kick-off extravaganza. This is a traditional, ceremonial event that’s held every year at about 6:30 p.m. at Pere Marquette Park at 900 N. Plankinton Avenue in Milwaukee. This year will be the 100th year! On kick-off night they always add a lot of extras. For example, this year there’s going to be free hot cocoa, free cookies, and free rides aboard the “Jingle Bus.” This is a great family event that you can take the kids to. Of course, some people will be decorating their own landscapes with Christmas lights the moment Black Friday hits. 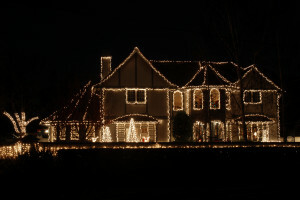 We thought we’d take a moment to share this website devoted to decorating your yard with Christmas lights. The site is called Christmas Lights Etc., and it will show you plenty of photographs so that you can get some ideas for your yard. We especially liked the idea of stringing lights along fences and pergolas. After all, you don’t have to climb any ladders to string those lights, and they provide a nice, twinkly border for your home as well! Mini-lights or icicle lights work best for this kind of decoration. If you don’t have a fence yet, remember, we continue to install them in winter, at least until the ground freezes. We also liked the little walkway trees idea that they had. These might not work for you if you already have low-voltage landscape lighting installed, but they were super-cute and whimsical. However, the nice thing about the Milwaukee event is that you can just go without hanging up anything at all in your yard. You can get more information at this website.